I always keep pen and paper next to my bed just in case I wake up with a brilliant idea or unique dream that might prove book friendly. After all, something about sleep often brings about plotting solutions or new ideas. Last night, my mind painted an odd scene that could easily become the back drop to a fantasy novel. Of course I've never written a story about other worlds, but I jotted down the scene just in case. This vivid and original world may one day house a troubled teen running from mobsters, a lost kid, or a team of nasty girls. Who knows what I'll be writing in the future--floating moons in reddish-pink skies? You never know. I've heard the most dangerous spot in a children's novel is to be the dog. In Tennessee, it's to be poor, and the treatment of these two groups is similar. I read with horror that our new Republican governor plans to fix our budget by putting an ax to TennCare, our low-income health provider. This $300M cut will limit doctor and hospital visits for poor people. So if you're indigent and need a doctor, tough luck. It won't matter if the person is a child, elderly, pregnant, disabled, or needs a hospital visit--you may be sick for eight days. If you need physical therapy or a podiatrist, just buy a wheelchair because TennCare won't help you with these problems... oh wait, you're poor and can't afford one. Folks won't treat a limping dog either. They shoot it. Twenty-five years ago the world mourned the loss of seven bright explorers who boarded the Challenger. We watched Christa McAliffe prepare to be the first to teach a lesson from space and even envied her for being the one chosen. Folks tuned in to cheer Christa along with her shipmates Francis Scobee, Michael Smith, Judith Resnik, Ellison Onizuka, Ronald McNair, and Gregory Jarvis as they waved to the cameras and headed toward the shuttle. This moment-we'd all waited for-morphed into the moment we'd all dread when the ship exploded in front of crowds of people and television cameras. Today's news reporters have asked us to remember what we were doing when we learned of this disaster. It's not tough for anyone who lived through this news story. The memory took root in my mind twenty-five years ago and is still as vivid as ever. My husband and I were in an airport returning home after a visit to my sister's house. As we stepped off our plane, the airport buzzed with stories from travelers deplaning one gate over. 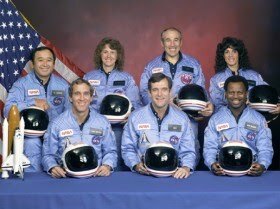 They'd witnessed the Challenger explosion first hand when the pilot came over the intercom and told everyone to look out the window to see the Challenger taking off. The passengers watched in horror as the O ring separated causing the shuttle to burst into flames. The pilot did not speak to his passengers again. I'm talking about a beautiful and heart-wrenching story about Lina, a Lithuanian teen, thrust into a brutal environment by the henchmen of Joseph Stalin in the 1940s. 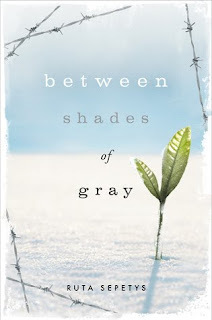 Between Shades of Gray is a story of survival and love found in overly harsh conditions. This book reminded me of a classic like Anne Frank and is destined to go far!